©2013 James A. Moore (P)2013 Brilliance Audio, Inc.
the story just doesn't pull me in. I'm a stay at home mom, and use audio books to keep my brain entertained while I do mundane hoysework. with this book, i will be going about my day, and realize much of the narrative had passed, and none of it really registered. I feel nothing for the characters, and only vague curiosity about the events swirling around them. if I hadn't already accidentally bought the second book in the series, I wouldn't have bothered to finish this one. I like the introductions of the characters and the understanding of who they are and their motivations. And there is mystery in the Sa'ba Taalor in wondering what is behind their viels and why they keep their faces hidden. And I like the way they are developed as more than brute warriors with the other aspects of their skills. Mr. de Vries did an excellent job in voicing the various characters and employing the different accents. The female characters were believeable with his vocal range and he was enjoyable to listen to. At times I was really into this and at times my mind was elsewhere. The book starts with a bang and got me excited for the rest. The biggest problem for me was keeping up with where the story was taking place. A character might be, what I thought was several days away in another area and the next paragraph he is with characters who were days away. The concept was excellent. Two peoples who have been separated for 1,000 years, suddenly find each other. In one culture, men and women are tough. They learn from an early age how to fend for themselves. They are all heavily muscled and trained in multiple weapons. Women are equal to men in combat and knowing how to survive under tough conditions. The other culture has gone soft and women are pretty helpless things. I am not sure if I will continue this series. 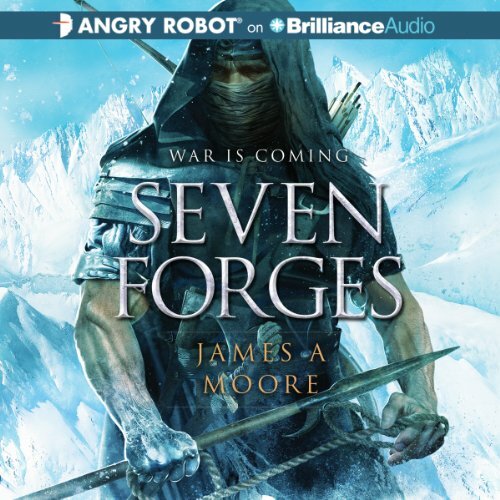 Where does Seven Forges rank among all the audiobooks you’ve listened to so far? This one has interested me enough to get the sequel ( I hope there is a sequel coming). The first three quarters of the book was by no means slow but still I was wondering where this is all going. It was all spent building a strong foundation for the characters, for the next in the series. A little bit predictable at times, as each scene unfolded. All very political and as diplomatic as possible, considering the circumstances of 2 civilizations that thrived for a thousand years with very different rules, customs, practices and beliefs. The reward was in the last quarter of the story. The last quarter the story took such an unexpected turn. As events started to almost simultaneously occur, all things predictable was gone and the book ended in a series of cliffhangers and with the promise of a very unpredictable, action packed and magical sequel. I hope there is a sequel really soon. Would you recommend Seven Forges to your friends? Why or why not? Absolutely would recommend it but I may have to wait for news of the sequel. Nobody likes to be left hanging. Which character – as performed by David de Vries – was your favorite? Nothing in particular stands out. There were a few moments of jesting which was funny and made me chuckle. I have seen this book for months and contemplated whether to get it or not. I'm glad I did... It is an excellent start to an epic series. I hope the rest of the books live up to the first and get even better. Seven forges is a story of two countries kept apart from each other buy a treacherous landscape for generations, whose cultures are vastly different from each other, and their attempt to establish relations. One country is quite civilized and the other is barbaric. It's also a hero's journey for one young man. Dave de Vries narration is either good (never great), or bad, and in this case it's good. I found the story to be very slow and most of the book is about violence and I don’t care for that. I think young teenage boys might like this because of all the fighting. Solid beginning and 4-star effort.. This book ranked fairly well in comparison to my other favored books. I WILL be getting the next book in the series as it promises to only get better from this point on. This book only suffers to "first book" syndrome as i call it... character introductions, world introduction, mythology, and story building. All in all this book, in my opinion, would have done better with an additional 50 pages or so for further character development...solid start though. The smiths apprentice. i will not say more as to not put any spoilers here. I have not listened to any of his other performances yet but he did a good job varying accents, male and female voices, etc, to produce an enjoyable tale with recognizable characters based on his voice. very well done. No extreme reaction. it was not meant to make one laugh or cry. A solid first installment with grimpses of greatness possible for future volumes. Had some great twists and turns Can't wait till we have the next one. Was a fresh play on my normal fantasy books that I listened to. I started to listen to this after finishing Angus Watson Reign of Iron and I was seriously considering not listen to it all the way. But I hanged on to it and I don't regret doing it. The people and the story didn't engage in the beginning but I found myself not being able to stop listening after about half the novel. I even went straight in to buy the second novel in this triology and after finishing this review I will start listening to it too.